This is the kind of archiporn that I am a sucker for; gamespace urbanism exploited to its extreme condition. Can you ‘win’ urbanism? Is this even urbanism? If not, can we take anything from its construction? The primary move that the city makes is to remove cars altogether and base transport purely on subways. I suspect this is a method to exploit the space otherwise taken up by roads for real estate allowing for an increased population per tile, however, it is a strategy that many cities—Sydney included—are seriously looking into. Remove motor vehicles, increase public transport. Seems like a sound idea. 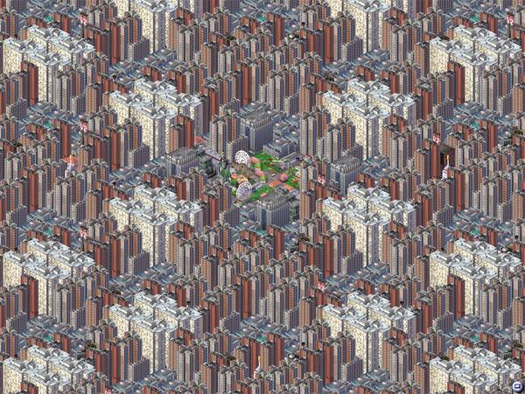 But ultimately, Magnasanti has little to do with urban design and everything to do with gaming systems for maximum reward. There are a lot of other problems in the city hidden under the illusion of order and greatness: Suffocating air pollution, high unemployment, no fire stations, schools, or hospitals, a regimented lifestyle – this is the price that these sims pay for living in the city with the highest population. It’s a sick and twisted goal to strive towards. The ironic thing about it is the sims in Magnasanti tolerate it. They don’t rebel, or cause revolutions and social chaos. No one considers challenging the system by physical means since a hyper-efficient police state keeps them in line. They have all been successfully dumbed down, sickened with poor health, enslaved and mind-controlled just enough to keep this system going for thousands of years. 50,000 years to be exact. They are all imprisoned in space and time. Given mammoth’s professed interest in finding overlap between gameworlds and cities, it’s probably not surprising that this leads me to wonder: what other games might be used to produce critiques of cities, or buildings, or landscapes? I’m particularly interested in this question because of a minor pet theory, which is that one of the most important futures for video games — if they are to become as important a venue for cultural expression as they have the potential to be — is less about the design of spectacularly complex linear (or even branching) narratives for video games, and more about the sharing, re-telling, discussion, and celebration of emergent narratives and objects created by players. Pro Vericelli or Oil Furnace, in other words, not Mass Effect. A little while ago I spat out a series of tweets for “#idiosyncraticallyarchitecturalvideogames”, some of which (Love, Detonate, Mirror’s Edge) would seem to be excellent fodder for this sort of thing. If, for instance, as Geoff Manaugh has argued, “the bank heist and the prison break together might form the architectural scenario par excellance“, then surely a game like Subversion — “a Mission Impossible-style spy thriller” set within an infinite array of procedurally-generated cities, neighborhoods, buildings, and bank vaults — could be played with the intent of exploring such scenarios (and, if the player is particularly clever, played with the intent of expressing a certain set architectural ideas). 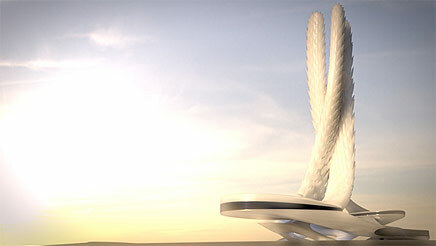 What happens, basically, when architects play video games as architects? This is extreme "Plan voisin"! IMAGE: Street Life, a project by The Living (David Benjamin + Soo-in Yang) in association with the Living Architecture Lab at Columbia University Graduate School of Architecture, Planning and Preservation. In his lecture at Sci-Arc last week, architect David Benjamin of The Living presented these wonderful soup bowls, which he and Soo-in Yang designed for the 2009 Shenzhen & Hong Kong Bi-city Biennale of Urbanism/Architecture. IMAGE: Street Life by The Living. I’m a big fan of any food that talks to you, whether in the cryptic wisdom of fortune cookies or the logistics-laden transmissions of RFID-chip equipped milk cartons, but these bowls are especially clever. 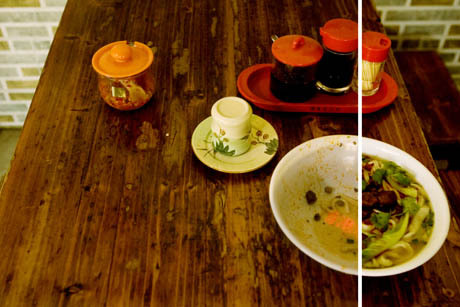 Benjamin explained that the basic idea was inspired by two defining features of South China’s cities: street food culture and the manufacture of electronics. 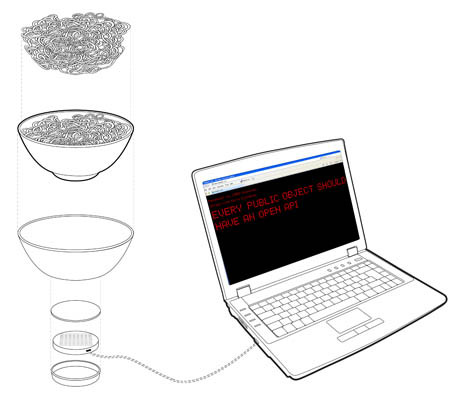 We designed and fabricated a custom soup bowl with scrolling LED messages hidden inside. We arranged for the curators of the Biennale to write short observations about the city and then program them into the bowls. And we arranged for several dai pai dongs around the city to serve food out of our custom bowls. IMAGE: Dai pai dong in Shenzhen, via The Living. 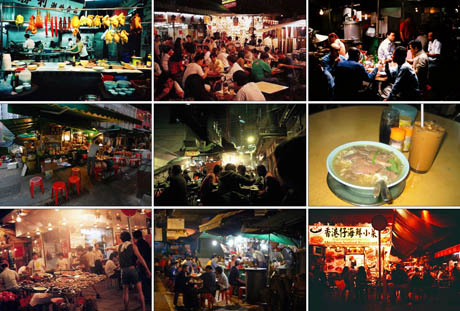 The dai pai dong, or open-air street restaurant, is all but synonymous with Hong Kong cuisine despite government attempts to dislodge them, while across the border in the electronics manufacturing hub of Shenzhen, thousands of assembly-line workers dine daily at dai pai dongs set up outside the factory gates. Local citizens come to eat their favorite noodles in soup at a dai pai dong. 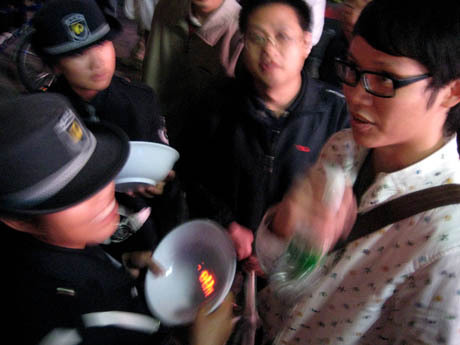 Halfway into the bowl—surprise!—they discover an LED message glowing at the bottom, provoking thoughts about the architecture and urbanism of Shenzhen. 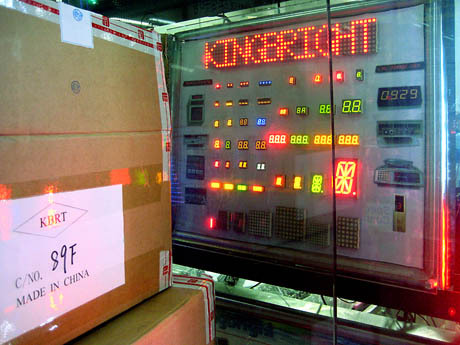 IMAGE: Electronics manufactured in Shenzhen, via The Living. IMAGE: Sample messages from Street Life by The Living. 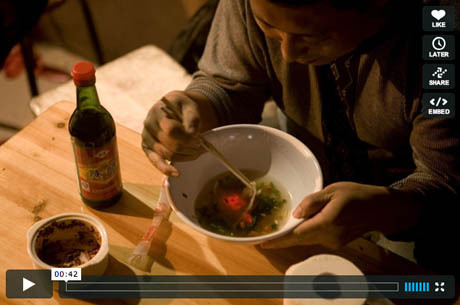 IMAGE: Click here to watch this short video of The Living’s Street Life soup bowls in action. 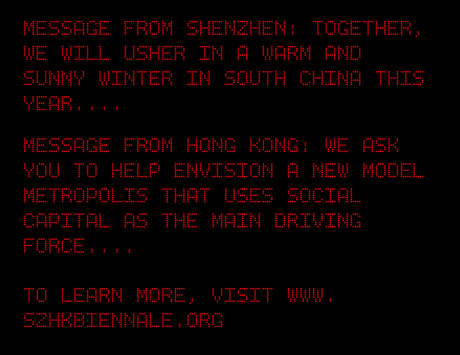 This idea simply seems too good to limit to a two-month biennale. Admittedly, in other contexts, the bowls would be stripped of their elegance as a reinvention of pre-existing local products — but still, the possibilities are endless! Anxious mothers could equip their university-bound offspring with an LED plate, sending text messages about the importance of a solid breakfast and vegetable consumption at appropriate times of day. Birthday meals could be served with a scrolling subtext of good wishes from long-distance friends and family. Farm-to-table restaurants could surprise guests with a greeting from the person who grew their dinner. Who knows, perhaps Israeli and Palestinian restaurants could even swap tableware to start a spontaneous, mobile-phone enabled dialogue between diners? I'm not so sure that the bottom of a soup bowl is the better location for statements about architecture... (while at the same time, it is true that this way of eating in Hong Kong is usually in conenction with a very dense and lively urban experience). Nonetheless, like Nicola Twilley I like the idea of reading while eating too. It's a common habit when one eats at noon, reading at the same time the newspaper or a magazine, sometime sms-es or while eating alone when travelling in a foreign country.